The small exhibition room #4 displays a pittance of those antiquities, but what treasures it holds. It's the main King Tutankhamun ("Tut") room, which draws travelers from around the world eager to see King Tut's famous gold burial mask, an artistic masterpiece (see photo). King Tut's innermost coffin, made of solid gold (his mummy remains in his tomb in the distant Valley of the Kings). 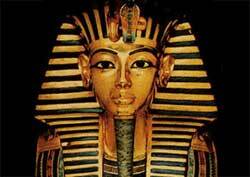 Tutankhamun was an obscure pharaoh who died at 18, too young to have much chance to leave his mark on history. He's famous only because his precious burial treasures were miraculously found intact in 1922, untouched by the ancient tomb robbers who stripped the burial chambers of the major pharaohs. We can only imagine how magnificent the treasures in those tombs must have been. The Egyptian Museum has more displays that render visitors speechless, including the royal Mummy Room where famous pharaohs lie in state. You come face-to-face with the exposed mummified head of Rameses II, the greatest pharaoh of all time.